This Tasawan Saneewong movie page contains 21 records. The action takes place around 1930's. Nuanchan is looking for her husband, who has disappeared one year ago following a business trip. She arrives in a old traditional Thai wooden house where he is supposed to have stayed. She is pregnant. The house supervisor, Somjit, allows her to stay but told her not to go in the main building house as it is forbidden as the house ruler, Run-juan, doesn't want to be disturbed. Choi, a domestic helper, mentions she has never seen the house ruler face. Every fifteen days, food is offered at the spirit shrine and she saw a hand grabbing food... Nobody dares going out at night time. There are also rumours about a lady with long hairs who hanged her-self in the garden. Nuanchan misses her husband but mysteriously his face is never shown. Nuanchan delivered the baby. Choi wants to bury the birth remains in the soil as there is an old belief that the spirit "Phi Kraseu" (ผีกระสือ) will eat such food at night time. The house ruler Run-juan has lost her husband and there are rumours she is bringing a lover at night time. The house ruler Run-juan wants to take care of the baby as she never had the occasion to have a baby before. Choi disappeared. One day Nuanchan finds her husband in the garden. He is not able to tell the whole truth but he is staying with the house ruler lady and asks Nuanchan to leave for her own safety. Finally truth is known. Chob is in fact the house ruler lady's husband, who had an infidelity with Nuanchan. So Nuanchan is the mistress! Afraid to loose him, the house ruler lady stabbed him to death. Somjit, seeing the event, fell from the stairs and died. Choi is also a ghost. All people are ghosts. Nuanchan also is a ghost as she hanged her-self before but she still refuses the truth so continues to come to the house to search for her husband. Even if the third movie of Wisit Sasanatien was not as colorful as two previous works, he received a lot of praise for the homage given to films of the 1930s. A woman is courted by a giant snake. The baby born from their love has hair made of small snakes. Local villagers disdain the mother and her daughter. The daughter grows and becomes a beautiful woman. Will she ever be happy and find the true love? As Wally is living without a mother and with a blind grandmother, her father stops being a monk in order to take care about his daughter. Many people gossip that he is interesting by donations given by many Thai people. Wally's sad life continues with the loss of her father and then grandmother. She finally succeeds her university graduation. 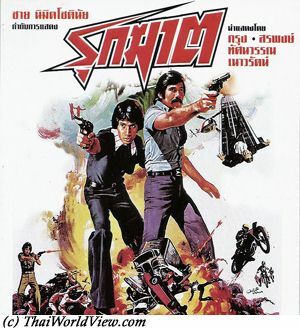 Thai movie สามเณรใจสิงห์ was released in year 1985 and lasts 1h38mn. It is available under VCD format. Some of the actresses and actors are ด.ช.ขุนพล ฉ่ำเย็นอุรา, สุประวัติ ปัทมสูตร, วรนุช ลุนเผ่, โชติช่วง พุทธสิน. 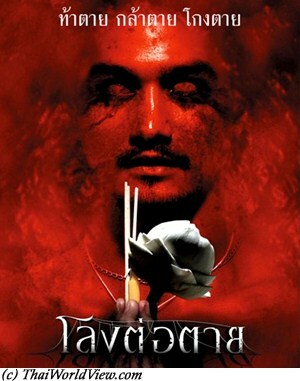 Thai movie สามเณรใจสิงห์ is a powerful movie about Thai Buddhism and people greediness. The story was written by a Thai monk. A family has four kids. The wife Sae (Tasawan Saneewong) is managing a small restaurant selling food and drinks. The husband is a drunkard. He has a group of 4 friends (including Pao Porapak) always drinking together. He keeps asking money to his wife to buy alcohol. The grandmother is rich and keeps supporting her daughter. One son called Sing Chai is still going to school. Two other daughters and another son are not doing much except asking for money, partying, taking drugs. One day, one of the son's friend tries to steal money from the grandma by threatening her with an artisanal bomb. It ends badly as the grandma dies and the son loses his leg in the explosion. Sing Chai believes there is a waste of money and injuries as a huge and expensive funeral is organised with outdoor movies, firecrackers... Luang Ta (Sor Asanajinda) is always around. It is Buddhist lent (เข้าพรรษา) coming and Sing Chai is sad to see his family going towards this wrong path. Sae and her husband argue on money, so she gets beaten and then asks for divorce. Sae then keeps playing cards. One day one of the daughter Usa is found dead having been raped by thugs but her parents don't care. Unable to support this anymore, Sing Chai enters monkhood as novice. Sae has a new lover, i.e. the village leader, who keeps borrowing money from her. Sai, one of Sae's daughter, is also his mistress. Luang Ta keeps smoking and delivers sermons in old fashioned way. Novice Sing Chai delivers sermon in a modern way. It makes Luang Ta upset as a novice becomes more popular than him. Even Piathip Kumwong is not visiting Luang Ta anymore but novice Sing Chai to get advice. Sae, knowing that the villager leader and her daughter Sai betrayed her (คนทรยศ), wishes to get suicide. Novice Sing Chai helps her on time and the mother becomes a nun. Young teen girl Chantana is back to the village and invites novice Sing Chai to get alms everyday (รับบาตร). Sing Chai is feeling awkward caught by human feelings toward Chantana. Luang Ta tries to catch him doing improper things (ศึกแน่ๆ). Sing Chai is even accused of committing a murder. Village leader Gneun, father of Chantana, is causing troubles. Luang Ta recognizes he was wrong to try to accuse Sing Chai. Gneun is finally shot by Sai as he was refusing to recognize his paternity. Sing Chai rejects his mother due to bad feeling but recognizes his mistake. He still hopes to convince his father to stop drinking alcohol. On the way to his father's home, a fire occurs. Sing Chai saves his father but the handicapped son is unable to flee. Mother Sae (ยอมแม่) is sick and dies while listening sermon. The father (ยอมพ่อ) becomes a monk also. The movie ends up on Sae's funeral where Sae’s voice in background regrets to have led such a bad life. Ruffians attack a bus and put fire into it. Hopefully military can help on time but some passengers die. Who was behind the ruffians? A local villager Chat is having financial difficulties. Nemana and Data, owners of the local sawmills, lend money to poor people with high interest. Chat bought a truck. He is close friend with Tai (Sombat Methanee), who is a village scout (ลูกเสือชาวบ้าน). 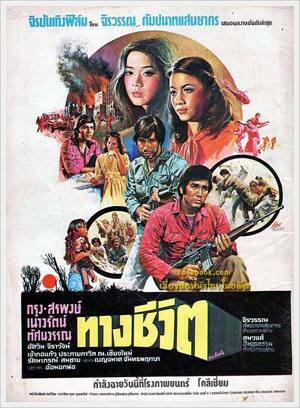 The Village scouts was a right-wing group sponsored by the King and Queen of Thailand to promote national unity in 1970s. Villagers are helping each other. Due to debts (หนี้) Chat needs to give his rice fresh crop to Nemana. Poor (จน) people just work for the rich! Nemana gives him back the truck against his wife’s rice fields guarantee and allows him to cut trees in forest. He befriends with Prachan, who is Nemana’s close associate. Despite Nemana's promise, some other ruffians try to catch Chat so he has to fight back for his life. 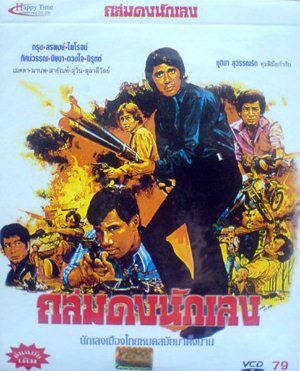 As he shots two men, he has to flee to Bangkok. They lie to him as the ruffians are not dead. He is driving a taxi in Bangkok. He gets framed by Prachan who puts drugs in his car (เล่นละคร) in order to increase Chat’s dependence to him as Chat needs to pay back his gratitude. He accepts to join their team. Nuan and Tai marry. Chat, due to easy money and lust, forgets his pregnant wife Bua (กรุงเทพสวรรค์คนมี นรกคนจน, คนลืมตัว). Back to the village Chat complains about the corruption of officials and how to benefit from it! Tai wishes to fight against this corruption that is bad for the country, fight against the bad parliament members. Tai and Chat disagree so fight (คนโทรยศแผ่นดิน). Nemana and Tai have a disagreement regarding rice selling. Tai pushes his democratic concept as villagers can sell to anybody (สหาย). It is democracy versus communism. Nemana proposes to share power and influence (แบ่งอำนาจ). As Tai refuses, they kidnap Nuan, his wife, who is teacher in order to force Tai to join them. Tai refuses their ultimatum and decides to act at nighttime. Faced to a Buddha statue, Tai prays in front of the Thai King and Queen pictures. 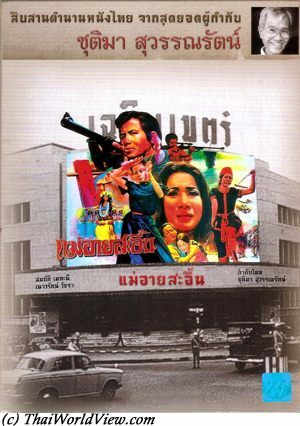 Thai Buddhism, the monarchy and the nation were high symbols against Communism in 1970s. Patriotic songs are played in the background (รักชาติ). Tai has to use a floating wing similar to a hang-glider to enter silently their camp. He succeeds to release Nuan but they are captured while trying to escape from the camp. Chat's mother dies on a mine while trying to convince her son (คนขายชาติ) to release Tai. Through his treachery he loses his mother (สร้างกรรม). He changes side so frees Tai and Nuan. Chat dies while holding the Thai flag. Tai takes over the Thai flag. Meanwhile villagers holding Thai flags and singing patriotic songs go towards the camp. Thai army is joining them. The ruffians are defeated and some of them injured or killed. Through high compassion, soldiers give help and priority to treat them. Tai successfully removes the red (communist) flag and replaces it by the Thai flag generating cheers and dances. 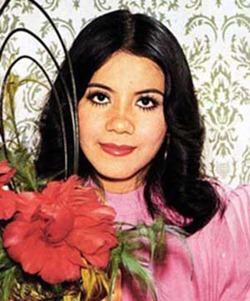 The song “Nak Phaendin” was released in 1975. 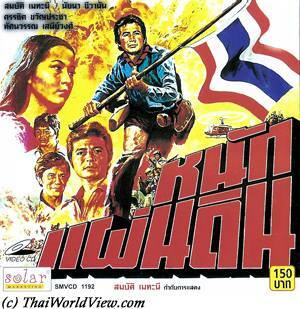 It is was a patriotic song (เพลงปลุกใจ) against the communist influence (คอมมิวนิสต์). During 1975-1980 years, Thailand was surrounded by Communist countries (Laos, Cambodia, Vietnam) and was at high risk to fall also. This movie from an historical point of view shows nicely this trouble period and how the government propaganda was done. It narrates the pure friendship story between two young boys and one young girl. They flee to Bangkok in order to try to find one of the boy's mother. During their journey, they discover the adult world, suffering, separation and death. 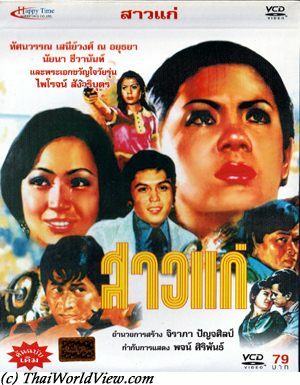 Thai drama movie สาวแก่ was released in year 1976 and it lasts 1h45mn. Doctor Pim (Phairoj Sangwaribut) and nurse พี่ Yot (Tasawan Saneewong) are boyfriend / girlfriend. She is 12 years older. Her close friend is Jaem (Mayurachath Muarnprasitivej). Chaninee (Naiyana Shewana) brings her father to hospital. Pim helps to cure him. Many people in the hospital gossip (นินทา) about Pim and Yot. Jaem has even some concerns about the couple (ความเหมาะสมผู้หญิงกับผู้ชาย). Knowing he fails to be chosen to be sent overseas as doctor, Pim involves in alcohol and Yot has to bring him back home. Finally Yot and Pim become lovers as Pim is pushing for it under alcohol influence. Chalat (Manop Aussawathep), a policeman, is introduced to Yot by Jaem as she believes Pim and Yot don't go together properly as she is much older than him. The doctor opens a clinic with Yot as assistant. Yot sold her land to pay for the clinic. They are still calling each other "พี่ Yot" (Sister Yot) and doctor (หมอ). Pim meets Chaninee another time as her father is sick again. The father finally dies. He presents Yot as elder sister (พี่สาว) to Chaninee. Yot wishes to marry to stop all rumors (คนนินทาไม่มีวันหยุด). Jealousy happens as Yot is aware that Pim is seeing Chaninee. She complains Pim changed since he is meeting Chaninee. Yot announces she is pregnant since 2 months. She wishes to die! Pim goes to Pattaya beach to relax and meets Chaninee by accident there. Yot follows him there in order to know the truth. Yot keeps reminding Pim about the favors and help (ท่วมบุญคุณ) she gave him. Finally Pim accepts to marry her in order that the child has a father. Yot remains very jealous. The baby is born. Yot complains she is not happy despite performing her wife’s duties (ทำหน้าที่ให้ดีที่สุด) as good as she can. Jaem recommends Yot to give him some freedom and she keeps complaining that Pim has to kindness towards her (ไม่รู้จักบุญคุณ). Jaem is now with an older man with 4 kids. She claims it is better for a woman to marry an older man than a younger man. Fed up and following arguments with Yot, Pim quits the house. Pim announces he loves Chaninee but as respect for Yot, he will not quit her. Jaem and Chalat bring Yot out. Seeing Chaninee, Yot argues with her but Chaninee claims she didn't see Pim since his wedding. Yot shoots Chaninee but hopefully Chalat is here to stop her. Chalat promises to take care of Yot so that both couples can have happiness. 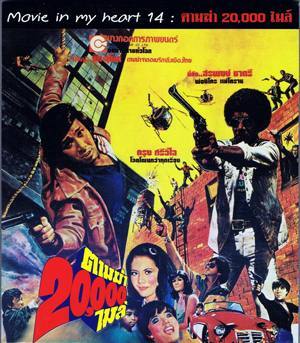 Thai movie สตรีที่โลกลืม was released in year 1975. It only lasts 1h10mn. Some parts are missing. The DVD is made from an earlier TV recording. Thaew (Metta Roongrat) is a bus money receiver (กระเป๋ารถเมล์) but she dislikes her job. Wone (Tasawan Saneewong)'s father is killed by a hitman (พ่อถูกยิง). Her boyfriend is Athit (Sombat Methanee). Athit is learning English. Athit sells some family land. He gets cash money from a lawyer (veteran actor). While going back home with his grandmother, they are aggressed by ruffians, who steal the money. The grandmother is killed. Athit chases the ruffians and finds that the mastermind is the lawyer himself. He chases him until a bank but has to back away as the police is coming. Meanwhile while going back home, Wone finds her mother in bed with a man called Prajak (น่าสงสารวิญญาณของพ่อ). He is the one who shot the father. Won dislikes him and he tries to abuse her. Wone complains to Athit but this one is focusing on taking revenge on the lawyer. Athit doesn't want to become a bad guy but life forces him (ไม่ได้ตั้งใจทำผิด มันมาหาผมเอง). Athit teaches a lesson to Prajak and injures him. Wone is chased by her mother from the house. Wone looks for Thaew but it seems she is now a prostitute (เป็นกะหรี่) as it earns more money. There is a visit to a rogue doctor as Wone needs to abort. Later on, the doctor wishes to meet again Wone but she refuses. He tries to blackmail her at her school with a picture taken during the abortion. Thaew promises to help her. He is finally arrested by the police as abortion is illegal act. Being rich, the doctor is released and warns Wone that he will take revenge. Wone is expelled from school as they receive the bad picture. Athit robs a shop. Wone realises than doing good is not always perceived positively by people (คนดี คนเลว). Athit promises to Wone to stop. Athit kills the men involved in his grandmother's death one by one including the lawyer. Athit's men continue to steal. Wone helps a child hit by a car and brings him to the hospital. Police wished to thank her. They knock at her home and finds Athit, who is arrested. Doing good has caused her demise. Movie director is ชุติมา สุวรรณรัต. Two other actors are เสริมพันธ์ สุทธิเนตร, อัศวิน รัตนประชา. 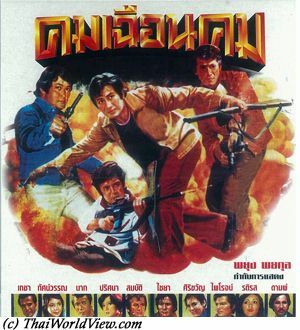 Thai movie ทับนางรอ was released in year 1973 and lasts 1h43mn. 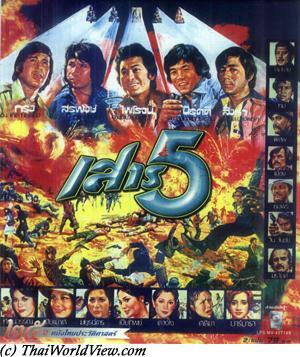 It was released under VCD format by Lepso Company. 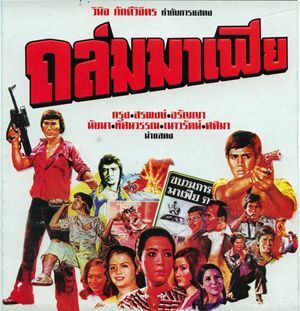 Sombat Methanee, Kamthorn Suwanpiyasiri, Pan Borapet, Jamroon Nuatjim, Tasawan Saneewong, Boosara Narumit, Tat Ekathat, Metta Roongrat, Malee Wetpraseri, Rong Kaomulkadee are the main actors and actresses featured in this movie. Movie director is ชุติมา สุวรรณรัต. A baby girl is abandoned in the forest as she has a deformed face (ลูกผี). She is rescued by Tat Ekathat and is named Sopi. At school, she is rejected by other children. Being an adult, her face becomes normal but a awful decease endangers her (อย่าพบความรัก). If she gives life to a baby, she shall die. Her parents (played by Boosara Narumit and Kamthorn Suwanpiyasiri) prevent her from seeing any boy. Chakapan (Sombat Methanee), a Bangkok young man, falls in love with her and asks for her hand but Sopi's parents refuse (เรื่องหัวใจ). Pim (Metta Roongrat) and Rong Kaomulkadee are having a romance. They keep helping Chakapan and Sopi. Sopi is aggressed by two ruffians, including Pan Borapet, working for the village leader. She flees but falls from a cliff. Chakapan saves Sopi's life so her parents finally accept the wedding but knowing that she shall die following a pregnancy. Sopi is now pregnant. Following delivery, Sopi's deformed face is back, so she flees from home with her child. She ends up dying in Chakapan's arms per the doomed prediction.